Should anyone ask for the current balance of any accounting system account, the ledger provides the information. In bookkeeping and accounting, a ledger is a book (or record) for collecting historical transaction data from a journal and organizing entries by account. The ledger provides the transaction history and current balance in each accounting system account, throughout the accounting period. At the end of the period, ledgers, therefore, serve as the authoritative source of data for building a firm's financial accounting reports. The Income statement is mostly a summary of account activity for the period in the firm's Revenue and Expense Accounts. The Balance sheet is mostly a summary of the current balances in the firm's Assets, Liabilities, and Equities accounts, as they stand at the period end. First, the ledger's role in the accounting cycle, the nature of posting, and practices in "continuous accounting." Second, how firms record and organize transactions of various kinds through the jJournal, Sub-Ledger, and General Ledger. The ledger's role in the accounting cycle? What is the difference between a general ledger and a sub-ledger? Sub-ledgers and controlling accounts (master accounts). Transactions for different account categories: Entering debits and credits. How do example entries appear in the journal and ledger? Role of the financial accountant: See the article Accountant. Daybooks and journals in the Accounting Cycle: See the article: Journal. 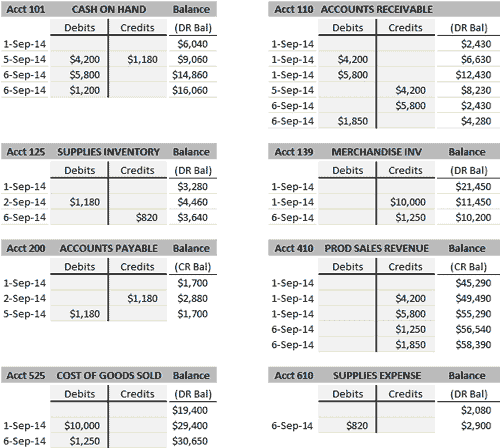 Overview of account categories and the chart of accounts. See the article Account. Overview of steps in the accounting cycle: See the article Accounting Cycle. Role of the Ledger in the trial balance period: See the article Trial Balance. What is the Ledger's Role in the Accounting Cycle? The ledger is rightly called the centerpiece of the accounting cycle. The accounting system and the firm's financial reports, after all, are "all about" the firm's accounts—their balances and transaction histories. The ledger is the authoritative source on this information, for all accounts. 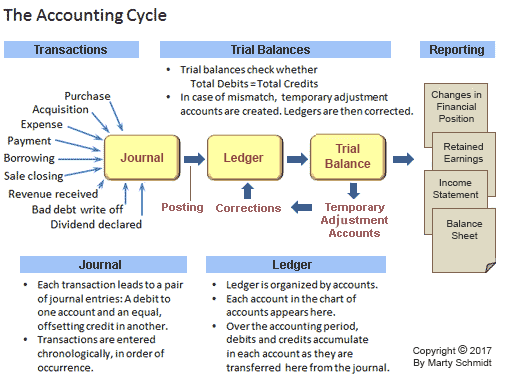 This section further describes the ledger's role in several steps of the accounting cycle. Exhibit 1 below shows the significant steps in the accounting cycle, as practiced with a with accrual accounting and a double entry system. The overwhelming majority of companies and organizations, worldwide, use this approach. Firstly, business transactions of many kinds occur, which must ultimately impact the firm's accounts. Earning revenues, incurring expenses, and many other transaction activities, are the first step in the accounting cycle. Secondly, transactions usually enter the accounting system as journal entries—the second step in the cycle. The journal records transaction entries chronologically, that is, in order as they occur. Thirdly, journal entries transfer (post) to the ledger. The ledger organizes transactions by account, to show each account's transaction history and current balance. Fourthly, just before the end of the reporting period, accountants use account balances and transaction histories to create a trial balance. The primary purpose of this cycle step is to check ledger accounts for accuracy by trial balance.The trial balance should show that total debits equal total credits across all accounts. They perform other kinds of error-checking at this time, as well, making corrections and adjustments when necessary. Fifthly, the firm ends the cycle by publishing financial statements (financial reports). The Income statement, Balance sheet, and other statements, essentially, consist of account balances and account histories for the period just ending. Exhibit 1. The accounting cycle. Transactions enter the journal as the first and second steps in the accounting cycle. The journal is a chronological record, where entries are build in the order they occur. Journal entries transfer (post) to a ledger, as the third step. Ledgers organize entries by account. Historically, journals and ledgers were always bound notebooks in which bookkeepers hand wrote entries shortly after the firm closes a sale, incurs an expense, earns revenues, or any other event that impacts the company's accounts. Today, of course, journals and ledgers usually exist as software and data records in the firm's accounting system. Bookkeepers in large firms still make transaction entries, of course, but quite a few other individuals may also contribute entries as well. Entries are created manually, through onscreen forms, but many entries are also made automatically (for instance, by a point of sales system). Electronic accounting systems, moreover, usually provide user guidance and error-checking, to help ensure that transactions impact the appropriate accounts and that debit or credit entries register correctly. The software also automates other stages of the accounting cycle, including the third stage—posting journal entries to a ledger. Until the middle of the twentieth century, when bookkeeping and accounting meant handwritten notes on paper, the posting of journal entries to ledger accounts was infrequently done during the accounting cycle. However, with electronic systems, journal entries can post to the ledger continuously. And, systems check for errors, continually. Finding errors and making corrections need not wait for the end-of-cycle trial balance period. The practice of keeping accounting systems always up to date—ready for closing out at any time—is known as continuous accounting. What is the Difference Between General Ledger and Sub-Ledger? How Do General and Sub-Ledgers Work Together? The complete list of accounts that can appear for the organization's journal and ledger entries is called its Chart of Accounts. The general ledger represents every active account on this list. As a result, the general ledger (or nominal ledger) is the "top level" ledger. Each account has a balance, or account value, which can rise and fall as transactions occur. Account summaries in the ledger show at a glance transaction activity for a designated period as well as the current account balance (or, at least, the balance after journal entries were last posted). Anyone asking questions such as "What is the current cash account balance?" or, "Are sales revenues running ahead of expenses?" should find up-to-date answers in the ledger account summaries. When ledger accounts appear onscreen or in print, each usually appears in the form of a T-account, as shown in Exhibit 2. Like all members of the chart of accounts, this account has both a number (101) and a name (Cash on Hand). Exhibit 2. A ledger T-account for one account, Cash on Hand, for several days transactions. Cash on Hand is an asset account, and this means that debits increase its balance, and credits decrease that total. This account, therefore, is said to carry a debit (DR) balance. Figures under "Debits" and "Credits" are the result of posting transactions to the T-account from the journal. Because Cash on Hand is an "Asset" account, it carries a so-called Debit balance. As a result, debit entries increase the balance and credit entries decrease it. Note especially that T-shaped crossing lines help implement a double entry system convention: Debits always appear on the left and credits sit on the right. In large organizations, the Chart of Accounts may include hundreds of different accounts. In such cases, it may be helpful to use not just one ledger (the general ledger), but also use with it a set of sub-ledgers (subsidiary ledgers). A sub-ledger is organized and updated in the same way as the general ledger, except that the sub-ledger may include only a few accounts from the chart of accounts. Companies use sub-ledgers to put first data management into the hands of people who engage directly in transaction activity. A "Sales Account" sub-ledger, for instance, might hold only sales-related accounts, such as "Product sales revenues," "Accounts Receivable," "Shipping expenses," and "Cash receipts from sales." The sub-ledger, moreover, may list information that will not appear in the general ledger, but which is useful to sales managers. This information could include the identities of individual salespeople, for instance, or customers, or product lines, or specific regions. When firms use sub-ledgers in this way, they associate sub-ledger entries with specific accounts in the general ledger. One general ledger account, for example, "Product Sales Revenues" can represent the "roll up," or aggregate of several different "Regional product sales revenues" entries from different regional sub-ledgers. In such cases, the general ledger account is the controlling account or master account for the contributing sub-ledger accounts. The kind of impact (debit or credit) that a "transaction" makes on each ledger account depends on which of five Chart of Account categories includes it. 1. Asset accounts: Resources of value the business owns and uses. 2. Liability accounts: Debts the business owes. 3. Equity accounts: The owner's claim to business assets. 4. Revenue accounts: These can be, for example, earnings from selling goods and services, or investment income, or extraordinary income. 5. Expense accounts: Expenses incurred in the course of business. In practice, even a small organization may list a hundred or more such accounts as the basis for its accounting system, and most organizations use many more. Nevertheless, for bookkeeping and accounting purposes, all named accounts fall into one of the five categories above. Exhibit 3: As debits and credits enter the journal and ledger for different accounts the impact of the entry either adds to or subtracts from the current value (balance) of the account balances. Whether a debit or a credit adds or subtracts value depends on the account category. All accounts are either asset, liability, equity, revenue, or expense accounts. A credit of $100,000 to another asset account, reducing that account value by $100,000. The account could be the asset account "Cash on Hand," representing cash for the asset purchase. If instead of using cash, the firm finances the purchase with a bank loan, the offsetting transaction in the journal entry would be a credit to a liability account. The result of that transaction could be a $100,000 increase to the liability account "Bank loans payable,"
The debit and the credit from the acquisition will appear together in the journal entry, but when they post to the ledger, each impact a different ledger account summary (see the journal and ledger entry examples below). When the journal entry is complete, the fundamental accounting equation holds and the Balance sheet—as always—balances. The bookkeeper or accountant dealing with journal and ledger entries faces one complication, however, in that not all accounts work additively with each other in financial accounting reports. In some cases, one account offsets the impact of another account in the same category. These are the contra accounts that "work against" other accounts in their categories. "Accounts Receivable" carries a debit balance, meaning that a "debit" transaction to this account increases the account balance. "Allowance for Doubtful Accounts," however, is a "contra asset account ." The purpose of this account is ultimately to reduce the impact (balance) "Accounts receivable" contributes to the asset base. The contra asset account "Allowance for doubtful accounts" carries a credit balance, which means its value increases with a credit transaction. When these journal entries make their way into financial reports, the Balance sheet result is a "Net Accounts Receivable" that is less than the Accounts receivable value. In any case, the bookkeeper or accountant working with journal and ledger entries needs to have a solid command of double entry bookkeeping rules. It also helps to have accounting software that provides clear guidance and careful error checking. Exhibit 4. Eight items from one company's chart of accounts. These accounts illustrate journal and ledger entries in the examples below. In reality, of course, the full chart of accounts, journal, and ledger will include many others not shown here. However, for one week's activity affecting these accounts, the journal and ledger entries might appear as follows. On1 September, two customers place product orders, on credit. Customer1 orders $4,200 in products, and Customer 2 orders $5,800 in products. The company ships the products the next day, 2 September. Customer 2 pays for goods ordered on 1 September with a credit card ($5,800). Products were purchased by Customer 3 with cash for $1,250. The customer takes delivery immediately. Accountants find that supplies worth $820 have been used up since the last check of the supplies inventory. Customer 4 places a credit order for products ($1,850). This order has not yet shipped by day's end. A fast scan of the journal entries should make it clear that one part of the accounting equation holds, at least for these entries: Total debits = Total credits. The journal page shows clearly that every journal debit pairs with an equal, offsetting credit. The example also shows, that the journal, like the ledger, follows the practice of listing debit figures to the left of their companion credit figures. The journal page does not show directly, however, whether or not the company is gaining or losing money. That picture is not entirely in view until the accounting period ends and ledger account balances come together on the Income statement. That picture becomes more evident, however, when journal entries such as those above post to the ledger. The ledger summarizes transactions by account, showing each account's debits and credits. Ledger summaries usually show also how different account balances are running (e.g., balances for expense accounts and balances for sales revenue accounts). The second step in the accounting cycle is posting journal entries to the entity's general ledger. And, this step sometimes includes "posting" entries to various sub-ledgers as well. Historically, when journals and ledgers were bound notebooks, and entries were handwritten, journal data were posted into ledgers only periodically. That meant that account balances were known only through the most recent posting. Software-based systems, however, usually update ledger accounts frequently or even continuously. Thus, running account balances in the ledger are kept current, as suggested in Exhibit 4 below. Account summaries in the ledger are usually presented in the form of T-accounts, as shown above in Exhibit 2. Exhibit 5, below, shows the T-accounts for the eight accounts in Exhibit 3 and the journal entry examples above. Exhibit 5. T-accounts in the general ledger after posting journal entries.